Finally this is finished. I took it off the frame and frogged about 18" of the quilting. I was a tailor for 30 years so frogging is one of my strongest skills, ha! Then I started taking borders off bit by bit, straightening and reducing them. This is what I came up with. It's not perfect but passable, I think the customer will be happy. I spent more hours on this than I'll ever admit. I don't know what you did, but it turned out great. Yes you most certainly did. Congratulations...job well done. Doesn't look like the same quilt!! You worked wonders on it and your customer will have to love it. Excellent! You did a wonderful job! Yes, your customer will love it. The quilt looks awesome. What did you do to it to make it square? As a beginner I would not know where to even begin. I am always in awe of the quilters who work magic. That's terrific! Wow, Cindy! You really tamed this beast! Congratulations! I'm applauding (clapclapclap)! It's lovely now and not-so-lovely before. You did a great job! Please tell me you either charged for the fix or at least instructed your customer on the right way piece so the top is nice and flat? That's amazing. You are a great person as well as a great quilter. I hope she appreciates it. Thanks for all the kind words, I was surprised at the transformation myself! When I took this off the frame my plan was to give it back to her to fix, although I didn't really think she would or could so after a couple days of looking at it I started ripping. I took the bottom two borders completely off. Then I determined how much fullness I needed to eliminate, about 3" in width and 1.5" in length to get the corners up and even with that short part in the center. Then I started squaring up corners starting with the innermost border, there were 7 borders in all. I just did them one by one, and as I went I made the borders shorter by taking in seams here and there. There were a lot of seams to work with. Then I sewed the bottom two birders back on, simple as that..ha! And thanks again to all if you. I have to say I've not made peace with my machine yet and it's been 6 years, but the APQS community is second to none! I would really look over the next quilt and see just how "fancy" those borders are. You worked wonders with the first one, but shouldn't be expected to continue to make them like they should be. Wen I did that once for a customer that had a chronic problem with "full" borders, I trimmed off the extra fabric and pinned it to the spot it had been cut from. Seeing pieces several inches long made more of an impression than just discussing it with her. I'd love to say she totally changed her ways.... But things are a bit better. You diod a tremendous jopb with that quilt. I'd be afraid if you don't charge her for the extra work, she will get the idea you will fix them all and not charge. 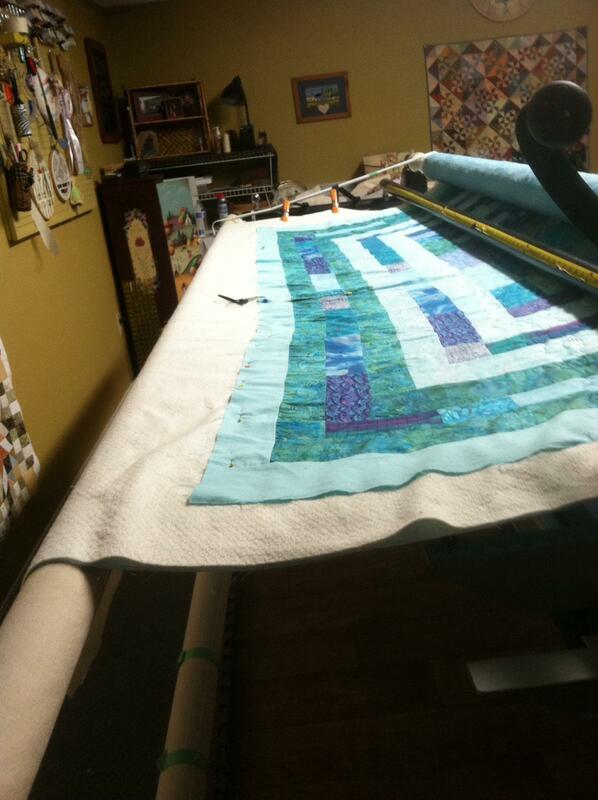 quilt that you had scheduled to work on someone elses quilts. Good Luck and talk sweet to Your Machine, and you two will bond.